Go ahead, be skeptical about big data. The author was-at first. 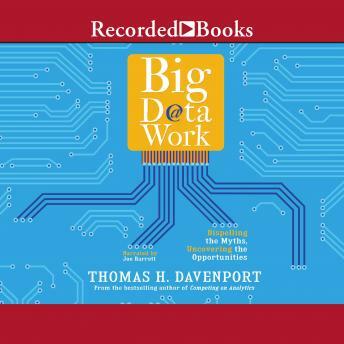 When the term "big data" first came on the scene, bestselling author Tom Davenport (Competing on Analytics, Analytics at Work) thought it was just another example of technology hype. But his research in the years that followed changed his mind. Now, in clear, conversational language, Davenport explains what big data means-and why everyone in business needs to know about it. Big Data at Work covers all the bases: what big data means from a technical, consumer, and management perspective; what its opportunities and costs are; where it can have real business impact; and which aspects of this hot topic have been oversold. This book will help you understand: Why big data is important to you and your organization; What technology you need to manage it; How big data could change your job, your company, and your industry; How to hire, rent, or develop the kinds of people who make big data work; The key success factors in implementing any big data project; How big data is leading to a new approach to managing analytics. With dozens of company examples, including UPS, GE, Amazon, United Healthcare, Citigroup, and many others, this book will help you seize all opportunities-from improving decisions, products, and services to strengthening customer relationships. It will show you how to put big data to work in your own organization so that you too can harness the power of this ever-evolving new resource.